The very best quality potatoes, sourced for their superior taste and distinctive crunch, are cut into crinkled slices and cooked right here in Dubai. The ridges and valleys definitely give you more crunch and hold more intense flavours! This is another classic and all time favourite flavour. 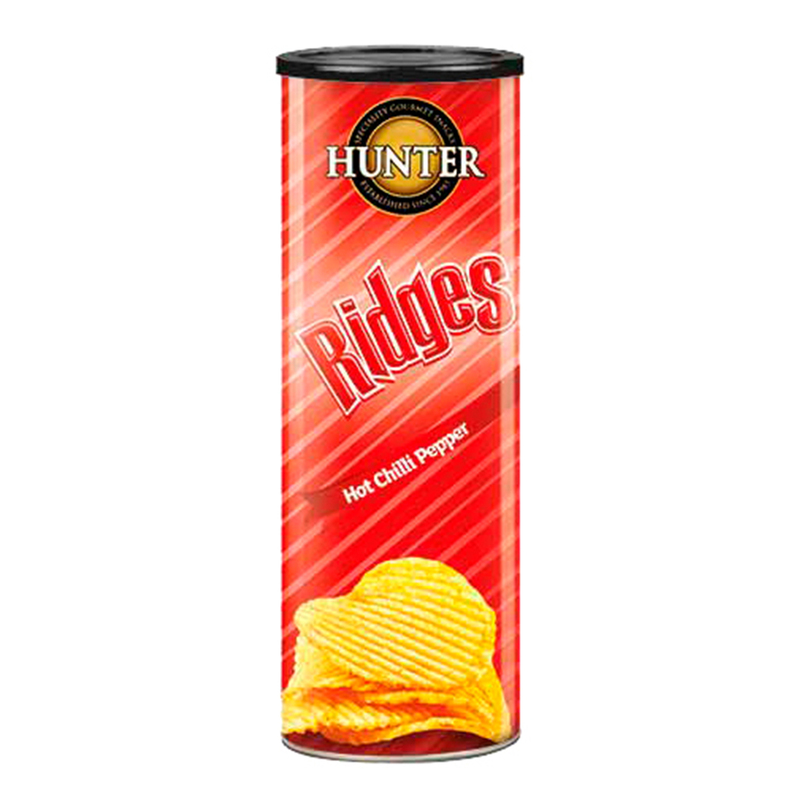 The rippled chips are delicately flavoured, with the intense aroma of the cheddar cheese coming to you first, then savory creamy cheesy taste to follow, bite after bite. They are gluten and MSG free and no artificial preservatives or colours, even though they are completely cheddar orange! Right afterwards, these chips are packed in our world-class, foil-lined canisters straight away. We definitely do our best to ensure that they reach you in all of their just-cooked, delicious glory. How about having them at your parties or movie nights? 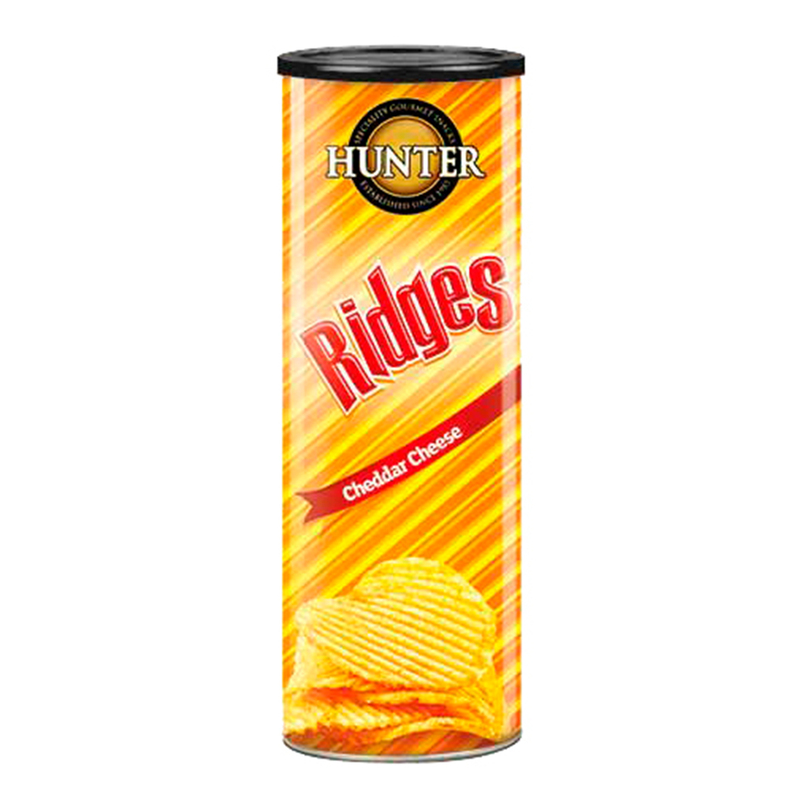 Hunter Ridges – Cheddar Cheese (75gm) 75gm Canisters. Potato Chips, MSG Free, Non GMO, No Artificial Colours, No Transfat, No Cholesterol, Halal. Potatoes, palm olein oil, cheddar cheese flavour: (whey, salt, sugar, food grade vegetable oil, bread crumbs, acacia gum, maltodextrin, silicon dioxide, food grade vegetable fat, dextrose, citric acid , triacetin, butter, milk protein, pentasodium triphosphate, polyoxyethene sorbitan monooleate, tricalcium phosphate, propylene glycol, BHA).